Story and main charachter are loosly based on historic figure of Guy Fawkes who in 1605 tryed and almost sucedded in blowing up house of Parliament in operation called Gunpowder Plot. This event was treated differently in different times of history by British Aristocracy. It was first riddiculed and offten mentioned but when it was obvious that opressed people used Guy as some sort bedtime story for children, tune was changed and there started censorship of this event. The fact is that for whatever reason the man, Guy, almost managed to wipe all of church, royal and politic leadership in fight against system. Something that echoes today more than ever. Words Remember, remember, the Fifth of November, the Gunpowder Treason and Plot. 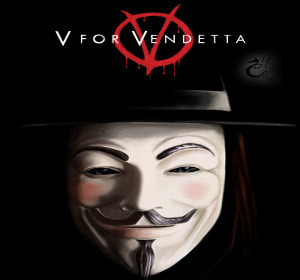 I know of no reason why the Gunpowder Treason should ever be forgot... that made up that forementioned bedtime story survived until 2005 when director James McTeigue, writers Andy Wachowski and Lana Wachowski created movie V For Venedetta. Vision about some future totalitarian British society with brilliant Hugo Weaving as masked terrorist(freedom fighter OxDict.) V, cast also includes great performances by Natalie Portman, Stephen Rea and Stephen Fry. Atmosphere, symbols, camera, effects actors, music and everything else about this movie is unique and deserves full viewers attention because there is not so many great pictures today. Especially hard is to find great movies with important and powerfull message these days so in that respect if you have not already Dear Reader go and see this one. Hurry because censorship and social state is nearing to totalitarism so question is how long this movie will be around. v: "Voila! In view, a humble vaudevillian veteran, cast vicariously as both victim and villain by the vicissitudes of fate. This visage, no mere veneer of vanity, is a vestige of the vox populi, now vacant, vanished. However, this valorous visitation of a bygone vexation stands vivified, and has vowed to vanquish these venal and virulent vermin vanguarding vice and vouchsafing the violently vicious and voracious violation of volition. The only verdict is vengeance, a vendetta held as a votive, not in vain, for the value and veracity of such shall one day vindicate the vigilant and the virtuous. Verily, this vichyssoise of verbiage veers most verbose, so let me simply add that its my very good honor to meet you and you may call me V.
-- Vs introduction to Evey (In simpler words) Behold! Before you is a humble stage performer, cast, against his will, by the whims of fate, to the roles of both victim and villain. The face you see now is not just some meaningless costume. It is a remnant of the Peoples Voice, which has since gone and disappeared. However, this past annoyance stands courageously reborn and has sworn to conquer the evil and corrupt, who promote greed and the violent suppression of free will. The only choice is vengeance, a personal war held as a promise, but not in vain, for the importance and self-evidence of this quest shall one day exonerate the watchful and the righteous. But in truth, this thick soup of words has become too excessive. So, let me simply finish by saying that its my very good honor to meet you, and you may call me V"
anonymous: "only future will tell if this will be necessary in your country too. " Solve this complex math: 9 + 5 = ?